I bought this toy chain stitch machine off Ebay, a nice looking and original clean condition toy sewing machine made in the 1940s--made by Gateway Manufacturing Co...manual operated and features pressed steel construction and has original red and cream finish-complete and in working condition, in very good overall structural condition with no damages or excessive paint wear. Measures 8 1/2 " x 5 " x 4 1/2" and looks and displays well. 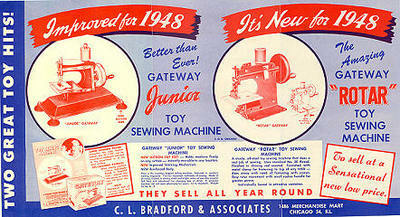 This Gateway engineering company, sewing machine, Junior model NP-1 ,Chicago, Illinois. Although the machine was touted as being made in the 1930s - it could have been made in the 40s or 50s - I take the middle ground and prefer to think 40s - going by the advertisement below. The Gateway Engineering Company was founded in 1937 and manufactured toys and wire bar supports. In 1941 Gateway moved to the Camp Washington Area in Cincinnati , Ohio . The company flourished and in 1961 the name changed to Gateway Building Products and a need for space prompted a move to Gateway’s current location in Miamitown , Ohio. 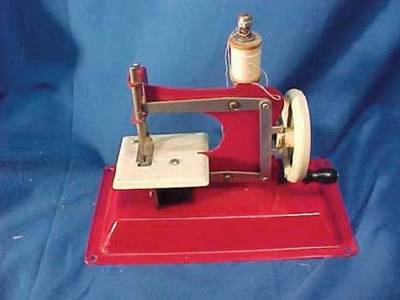 Description: Red metal sewing machine. Has a slightly torn yellow label adhered to it with words "Junior Model NP-1" "Gateway Engineering Company Chicago 51 ILL" "Patents Pending." Sewing machine has a spool of grey thread. Needle is in sewing machine. White wheel with a black handle is on end of sewing machine. Metal sewing machine is connected to red wooden base with hinges. Sewing machine opens at base. This was also an experiment with New Zealand customs. I could not understand all the rules and regulations about buying a sewing machine from overseas. They seemed contradictory and when I rang to clarify - I was more bamboozled than ever. The upshot was I went for it anyway, with no extra charges incurred. If you buy from overseas, check out the regulations for your country. Initially I thought this machine would be good for the grandkids or for me to use with papercrafting or scrapbooking. It's really too small for what I want - so I bought a second hand ($5 off an auction site) regular machine for the purpose. The tension is regulated by the nut on top of the cotton reel and sometime I need to adjust the timing. All in all, its a solid wee thing - nice to the touch.